Maybe you're traveling, and you just can't shower as much as you usually do. Maybe you've decided your hair looks better with a little grease in it. Maybe it's all about saving a little extra money on your water bill. Maybe you want to help the environment by conserving water. Maybe you're too busy to shower! Maybe you just had a baby and showering has fallen into the "luxury" category of life. Maybe you work in a cubicle and don't work up a sweat, so you don't really need to shower that much. No matter the reason, if you want to shower less and still feel clean, this is how you do it. A bird-bath is pretty much exactly what it sounds like. You stand in front of your sink filled with water and soap up your rag and then get to cleaning. You will forgo your shower, and you will feel clean. Dry shampoo is great because if you have fine or oily hair you can spritz in on your head, and then all the greasiness instantly goes away. There is the added benefit in that it thickens your hair and gives it texture. Plus it smells nice, so that's a treat too. Yes, a dry bath. I haven't ever tried this before, but it looks like it might be worth a shot. Extend your showers out an extra day, and gradually try extending them out longer and longer until you can't stand it anymore. You'll build up your tolerance, and you'll shake your shower-a-day habit. Pretend you are on a game show, time yourself, and try to beat your best time. Thirty second shower anyone? I challenge you to try it. Let the water collect in the tub from your shower and use it for your next bath. It will obviously be cold by then, but since we're coming up on the summer month's, maybe you will be able to get the added benefit of cooling off, too. If you smell clean, you are half way there…at least to some people. Douse your stinky (or potentially stinky) bits with baby powder. Be sure to rub it in and shake the excess off before going out in public, so you don't look too powdery or "George Washington-y." If you're the least smelly person in the room then, really, how could you not feel clean? 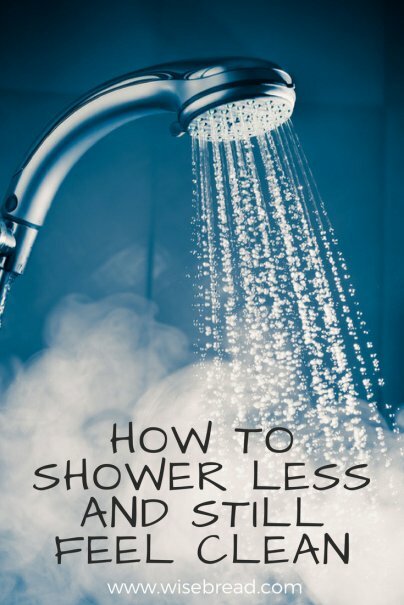 Have you ever considered showering less for personal, financial, or environmental reasons? If so, what tips do you have for showering less while still feeling clean? Nice joke/troll article, and I can actually imagine some people that would stay dirty thinking they're "saving money". In case the article is serious - I think cutting down on health or hygiene is the least frugal thing you can do, because it costs you so much more in the ling run. Revise your spending habits and focus on earning more rather than wash with sand to supposedly save money. I think the mistake you may be making is thinking that shower every single day is somehow more hygenic than taking a shower only when one is actually necessary. Or that you are "dirty" if you don't shower every day. Most people (especially in our sedentary, indoor society) do not need to shower or bathe every day. And there's no long run cost like you insinuate, unless you count approximately 70 gallons a week per person not heated and down the drain, and spending half as much on showering supplies, too. But, as an aside, I do believe brushing your teeth twice every day is necessary! Yeah, it's not a joke article. This is useful information for people. Showering often isn't something a lot of people want to do for a variety of reasons, and I hardly think that by showering every other day rather than every day that you're putting your health in jeopardy. Never considered showering less to be honest. If I had to I would try the dry shampoo or taking a shorter shower. The hanging with stinkier people is funny but not an option. Obviously if I start to stink, it's bath time! I love the idea of the dry bath, but my only concern is exactly what chemicals are in the gel. As long as it's safe to put on the biggest body organ, I think it'd be wonderful for travel and water-scarce areas! Any idea where one can buy it? Saving money really is a lot about cutting back any and every place that we possibly can; every single penny counts! I think as a culture we assume WE MUST shower every day to be socially acceptable individuals but I have heard from many people that by showering daily we're actually stripping our body and hair of it's natural moisture. I'm glad you found that you had healthier skin and hair because of showering less too. I'm not totally sure where to find the dry bath but it would be great for a road trip or camping! Hi - I put a bucket on the floor of the shower and it collects water which I use to flush the toilet throughout the day. you can use the water that collects while you are waiting for the shower to warm up (no soap, please) to water your plants. Share a shower! If you have a spouse/partner, it can be a nice way to conserve water, and have some together time! Please don't douse yourself in perfume or other chemicals to cover your body odor - it can be noxious and obnoxious for those of use with scent sensitivities, chemical allergies, and MCS. I would much rather someone smell like a human being than a fake chemical flower garden or musk factory and its easier on my own physical being as well. You can install a low flow showerhead which uses much less water then normal. You can also use rain water in an outdoor shower system. Lol, had fun reading this. Yeah, I don't really feel comfortable throughout the day when I don't feel clean enough when I go out of the shower. Glad you like it KC! The foods you eat and not drinking enough water can play a huge role in having more body odor. Eating more fresh fruit and vegetables and drinking water rather than soda or even tea/coffee can help flush your system so your liver and kidneys work better and thus you are retaining less toxins. We are fortunate to have a grey water set up where the water from the shower is sent outside to water the garden. Thus no real water waste. Bear in mind baby powder and perfume simply mask the smell rather than dealing with it. Plain old corn starch is also a better 'powder' than baby powder. Now that summer is here and it was 100* today, I took my Dr Bronner liquid hemp and lavender soap outside and after planting more vegetables and refilling the bird baths I washed my hair with the garden hose. Got clean hair, environmentally sound soap in the garden from washing my hair, and I feel much cooler. Oh and wear 100% cotton or linen clothing that is looseer in summer because unlike synthetics they don't hold wetness in but wick it away and evaporate it. You make a really good point about considering the foods you eat. I hadn't thought about that. Also really like the point about wearing cotton or linen. Cute! I would also say consider who you are going to see. If the next day is just hanging around the house, is the shower necessary if you have just been sitting in an office all day? I have a new baby, and a daily bath or shower is one of the top things I look forward to every day! Shampooing your hair BAD IDEA..You are washing away the sebum produced by the sebachias Gland,,(Spelled wrong ,I know)Sebum is natures way of oiling the hair root .By shampooing every day the Gland gets tired replacing the Sebum and GIVES UP.....Guess What? Good bye hair ..Hello BALDIE ..So every morning put your head under the shower and let the hot water run through it while you massage it,,,NO SOAP of ANY kind OK? You can ADD conditioners etc That's ADD But no SHAMPOO or SOAP ever..I promise you will keep your hair Not lose it.. In addition to showering less, I began making my own deodorant out of coconut oil, baking soda, and arrowroot powder. I keep mine in the fridge. It feels great, is non toxic to the body, and you don't get that day after deodorant smell. I also use coconut oil to cleanse my face twice daily which is antibacterial so I never breakout. I'm 48 and my skin and hair look great with the combination of only a couple of showers a week or less and the change in products.